These articles are only for animal consumption! Freeze-drying is a technique where under special circumstances moisture is extracted from products – in this case insects. Opposed to wind-dried insects, the nutritional value and the structure of the insects are completely preserved. Some insects lose their legs or wings. Contain a high nutritional value (especially interesting for young animals)! Can be stored very well, also during long periods. For many animals, insects are the natural source of protein in the food chain. The quantity of insects on the menu of these species, highly depends on their individual dietary pattern.Some species almost entirely depend on insects. Others only eat insect to supplement their normal menu. Some only have a strong need for this food during the brooding period or while raising their young. Freeze-dried insects offer the possibility, to put a well balanced meal together, tuned to the needs of the animals. Some insectivores will only respond to the movements of living prey. Other species, used to eating living insects, can easily learn to get used to freeze-dried insects, by mixing living insects and freeze-dried insects for a while. 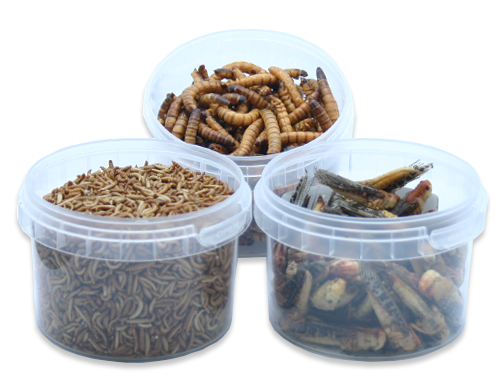 Kreca’s freeze-dried insects therefore are a valuable supplement to the menu of various animals. The freeze-dried insects can easily be added to existing fodder like all-purpose-, breeding-and concentrated fodder, but also to fodder consisting of seeds and/or fruits. The freeze-dried insects can also be added to fodder for reptiles (iguanas), turtles, large aquarium- (cycliden) and pond fishes, small mammals (hedgehogs, mice and hamsters). When added to mixed fruit or placed on a damp cloth, the freeze-dried insects will easily absorb moisture. As freeze-dried insects easily float on water, they are also excellent food for animals which get their food from the water surface, like various water fowl and pond fishes. You can also very well mix it with birdseeds for birds around the house. In spring they fodder their young with it and in winter, when there is snow and frost, they can really use the extra high-quality proteins.